Most cocktails aren't complete without a garnish. Not only do they add a bit of flair, but the right garnish can help take your cocktail to the next level with a new layer of flavor. Here are some simple tips for how you can dress up your drinks. Citrus garnishes are not only good for that extra bit of acid the juice can add to a cocktail, but also because of the stunning aromatic essential oils in their peels. A citrus garnish will complement most spirits, from gin and tequila to vodka and even the odd rum drink, particularly those with a citrus component like a Dark 'n Stormy. 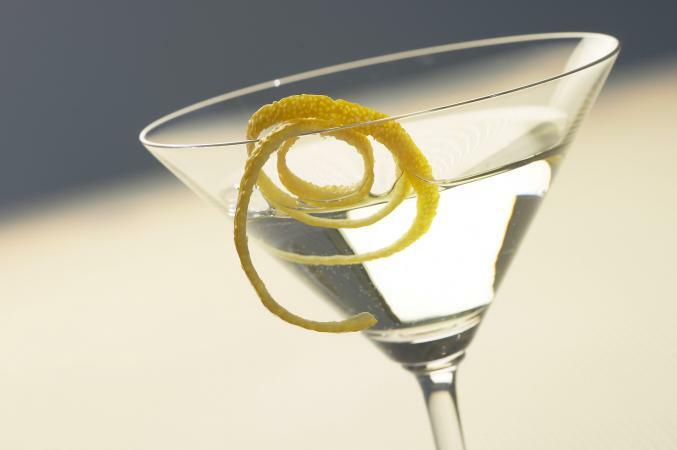 Making a lemon twist for a martini couldn't be easier. Using a paring knife, gently cut into the lemon peel without penetrating the fruit. Rotating the lemon, continue cutting into the peel, working around the lemon to form a single long spiral. 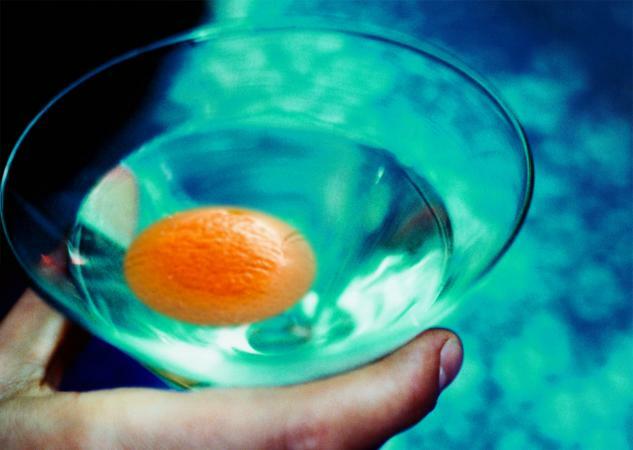 Drop the peel into the cocktail. Oranges are commonly used, but other citruses like grapefruit work just as well. 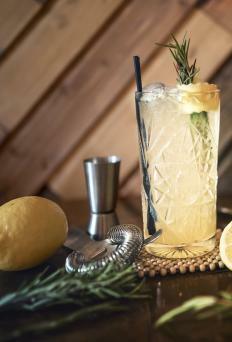 The coin twist is an easy, yet sophisticated garnish for virtually any cocktail. Cut a coin-shaped piece of peel without slicing into the fruit. With the pith facing you, gently squeeze the peel to release the oils into your cocktail. Lightly rub the peel around the rim of the glass. You may have seen craft bartenders using a match to ignite these oils as a grand finale of finishing off the cocktail. You can try this at home as well, just be careful! Lemon wheels are among the easiest garnishes to make; simply cut a lemon at its widest point and slice horizontally. Then pop the wheel into your cocktail and enjoy. Candied citrus peels are a delightful way to marry citrus with a bit of sweet. Cut the peels into strips, making sure to remove the pith. Place the peels in a pot of boiling water and let cook for about 15 minutes. Then drain and rinse with cold water. In a saucepan, bring the water and 2 cups of sugar to a boil, stirring occasionally to dissolve the sugar completely. Add the citrus peels and reduce the heat. Let the mixture simmer for about 5 minutes, then drain. Spread the remaining 2 cups of sugar on a large tray. Roll the peels in the sugar, then leave out to dry. Freezing fruits, flowers, or fresh herbs in ice is another fantastic way to add a bit of pizzazz to your cocktail. Add these to popular drinks served on the rocks as you will be using ice, anyway! 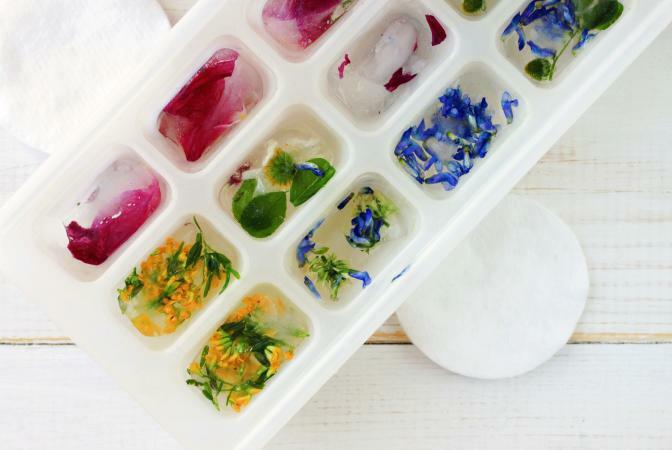 Fill up an ice tray with water and add berries, pieces of fruit, edible flowers, or fresh herbs. Leave them in the freezer until frozen. When they're ready, use them to chill down your favorite cocktail; they'll add a pretty pop of color and as the ice melts, release a hint of flavor into your drink. You can also skip the ice and freeze any fruits directly; your drink will never water down! 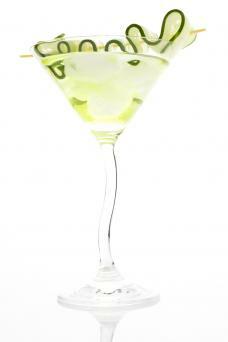 Cucumber and celery are also refreshing garnishes for bright, crisp beverages. Few things can beat a cucumber martini on a warm spring day. Thanks to its overall firmness, there are a variety of shapes you can carve out from a cucumber to garnish your cocktail. The simplest version is a cucumber ribbon. A ribbon looks lovely in a tall cocktail glass. Using a vegetable peeler or a paring knife, cut the cucumber lengthwise into thin strips. Spear the ribbon with a toothpick or leave as is and fully immerse it into your beverage. If you want to go one step further and make a cucumber twist, just take the cucumber ribbon you've made and gently spiral it between your fingers, then spear it with a toothpick. A rose is a beautiful way to dress up your drink. Using a pairing knife, cut the cucumber into thin strips. Place on a paper towel to soak up excess water. Take five or six slices and line them up so that their edges slightly overlap one another. Roll the slices up. Adjust the petals as needed, secure with a toothpick, and then add to your drink. Celery, of course, can simply be placed in your Bloody Mary, for example, without much fuss. Just cut it to fit in the glass and leave some of the top on for decorative purposes. Skewered garnishes are a familiar sight; from the traditional olive or cocktail onion in a martini to seasonal berries, they've all been done. Try updating the classic skewer by using stalky herbs instead of a toothpick. Rosemary, thyme, and lavender are perfect candidates. Take the fruit you've chosen and using a paring knife, make a small incision through which you can pass the rosemary or lavender. Insert the herb through the fruit. Repeat until you have the desired amount for your garnish. Garnish your drink and enjoy. You can also use a long toothpick and create a kabob by alternating fruits and berries, leafy herbs like basil or lemon balm, or edible flowers for a garnish that's both delicious and eye-catching. A cinnamon stick is a perfect skewer for hot toddies or ciders or even a hot buttered rum. If you want to add a unique spin on the skewer, try using beef jerky instead of a toothpick. This is a great one for Bloody Marys. Cut beef jerky into long thin strips. Carefully thread olives, pickled vegetables, garlic, cheese, lemon, or other desired ingredients onto the strip. Anyone with a sweet tooth must try using a candy cane (either peppermint or fruit-flavored) in lieu of a toothpick as a skewer. Instead of fruit, substitute gummy candies. It's a fun way to add a bit more sweet to any sweet or sour cocktail. If you want to get really wild, buy some fresh baked doughnut holes from your favorite bakery and stick one on a skewer for an utterly decadent garnish. 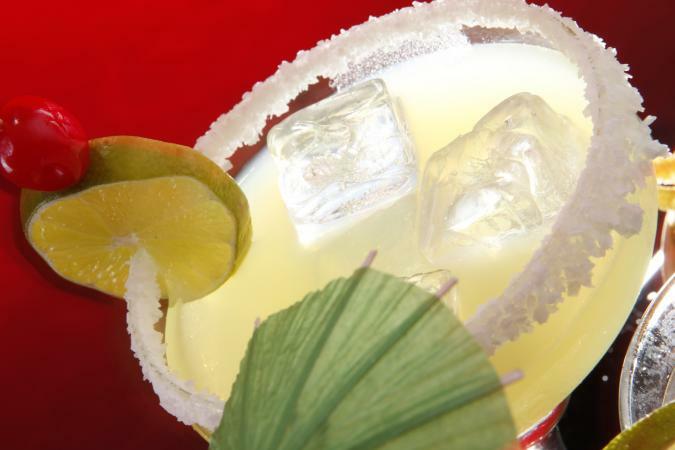 Use the following steps to make a make an infused sugar or salt rim garnish. Rub the rim of your cocktail glass with a wedge of lemon or lime, depending on what is appropriate for your recipe. Mix whichever seasoning you're using in with the salt or sugar on a small plate. Take the cocktail glass and gently but firmly press it into the sugar or salt mix. Now the glass is ready to be filled with your libation of choice. If you're still at a loss for the right cocktail garnish, there are the old standbys like the pimento-stuffed olive, the cocktail onion (without which, no Gibson is complete), and of course the Maraschino cherry. You can combine garnishes, for instance, fresh berries and lemon peel, or pineapple and lime. When in doubt, you can always just throw an umbrella in your drink and call it a day!